Mother’s Day is just around the corner and now is the perfect time to be thinking of special Mother’s Day gifts. I don’t think moms ever outgrow how much they love handmade Mother’s Day gifts from their children. This homemade gift is quite a jump from the little plant in a paper cup you made her when you were 5! She will absolutely love this handmade pendant. A twist on the popular Mother’s ring, this beautiful silver nest holds a bead in the color of each of her children’s birthstones and could not be more precious. When it comes to Mother’s Day gifts, this one is easy and inexpensive but rich in style and made with love! It makes a great affordable gift for mom! Cut a length of wire approximately 15″-18″ long. Begin forming the pendant by slipping the first birthstone bead onto the wire. 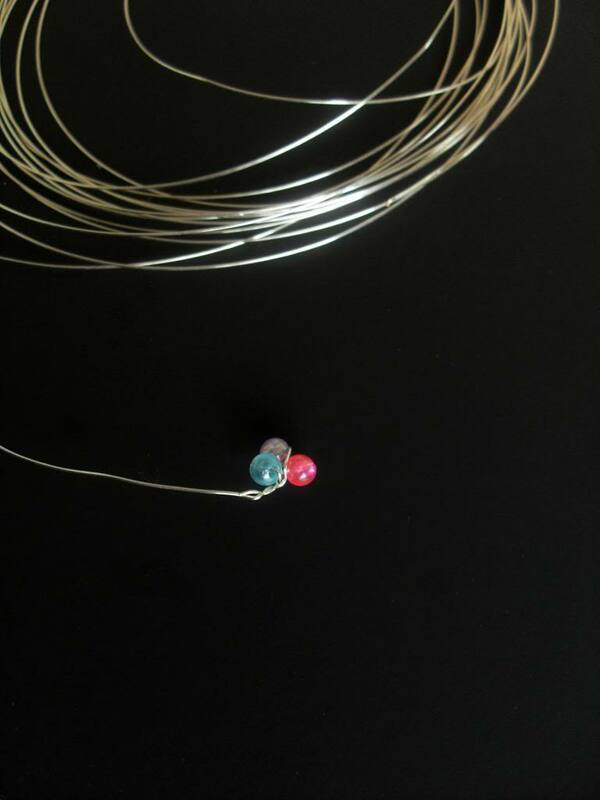 Secure the bead into place by twisting the wire and tucking it back into the bead. Add any remaining beads and secure each by wrapping and twisting the wire around the bead. 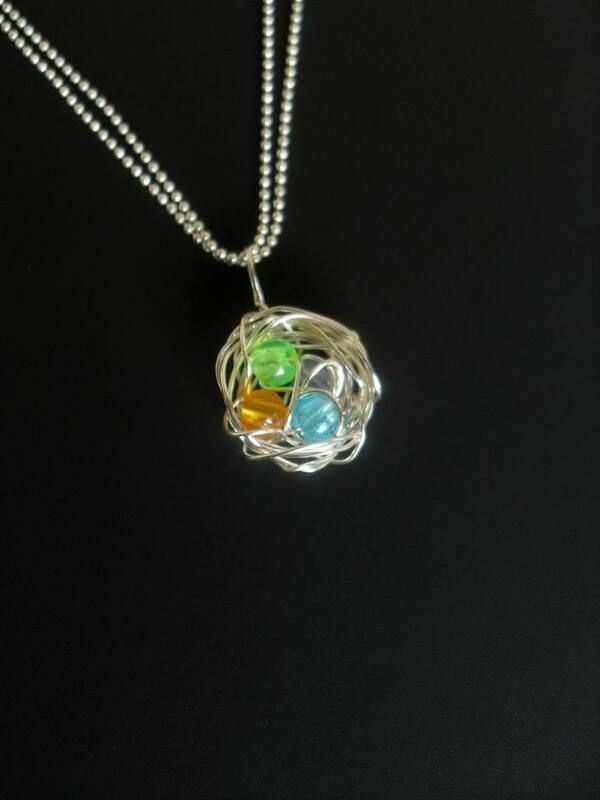 This pendant can be created with only one bead as well and is just as beautiful! After the beads are in place, you’ll begin wrapping the wire around and behind the beads to form the “nest”. Wrap the wire carefully, making sure not to crimp it, and thread it in and out of the nest as you go so that the wire intertwines. Continue wrapping the wire until you’ve created a beautiful little nest to safely keep all of mama’s little eggs. For the final step, you’ll need to create a small loop of wire for the pendant to slip onto a necklace. Add the loop to the top and twist to secure it before feeding it back into the nest. Use the wire cutters to secure the end of the wire into the back of the nest, making sure there is not a sharp end protruding. And that’s it! 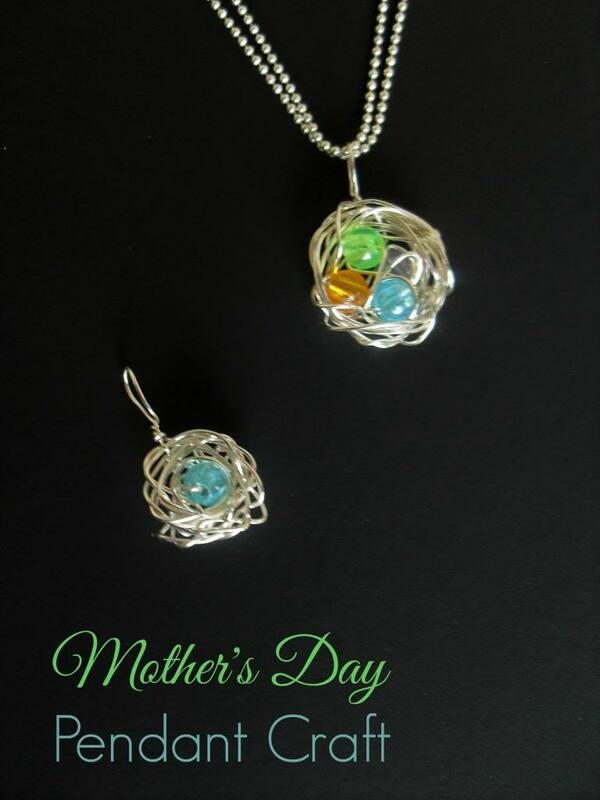 You have an elegant, thoughtful, homemade Mother’s Day gift to give that special mom in your life! Head over to MyKidsGuide if you’re looking for cute Mother’s Day crafts for kids! i love this! i would make this for my mom and hope my daughter would make one for me. it’s so lovely and simple. So pretty! I would love one of these pieces. Very cute idea and it doesn’t look too hard to do, might have to give it a try! This is so pretty! Thanks for posting this! I got my sister for secret santa this year and I know she would love this! I have hinted heavily in the past to my husband that I want a necklace like this. Now I think Ill just go make my own lol. I wish I had seen this sooner! However, I could do a practice run for myself and I would not complain. These would make great gifts for all the family women next Christmas too! That’s really beautiful! Where do you buy jewelry wire? Thanks everyone for the great feedback. These are acrylic beads but glass would be beautiful as well! This is a cute craft. Thank you very much for sharing! What kind of beads did you use? Glass? Acrylic? Would love to make this! I am going to be making one for myself as well as for gifts. I’m glad you’re all enjoying the idea! Wow! These absolutely do not look homemade and my kids would have so much fun making this for me. Great idea. what a pretty idea, I want one with my kids birthstones. I am going to have to check this out. This is too cute and looks like something could actually make. Might actually do this the Grandma’s at Christmas too. That is so pretty. I am going to have to try to make this at home for myself. I have most of the supplies already.